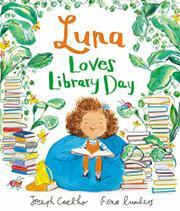 What makes library day so special for Luna? It’s because her dad is waiting for her there, and together they choose all kinds of books, each one emblematic of a connection between them (bugs—she loves them, he hates them; magic—he “knows how to disappear” while “Luna wants to learn how to bring him back”; his Caribbean island home). Together Luna and her dad read The Troll King and the Mermaid Queen, which is a six-page rhymed story inset inside the book that is clearly a metaphor for Luna’s family history. When it’s time to leave, Luna checks out Unexplained Mysteries, Mini Monsters, Magic Mayhem, and Memories of the Imagined Island as well as the inset book. Now she has a book bag full of memories. Luna’s parents are clearly separated or divorced, and library day is her time with Dad. Biracial Luna has light-brown skin and curly auburn hair, her dad is black with an Afro, and her mom is white and blonde. Colorful, winsome illustrations depict Luna with dots for eyes and a curve for her mouth. This simple story of often familiar circumstances has many pluses—seemingly amicable separated parents who love their daughter, the story within a story, a plug for libraries (there’s even a self-checkout) and reading—all of which generate an upbeat feeling.